Will My NH Home or Auto Insurance Cover an ATV on a Public Road? Even if you never go on public roads and like to hit the trails instead, you would still need a separate ATV insurance policy. How do I Insure an ATV in New Hampshire? As the likelihood of an accident is much greater on a public road with traffic, pedestrians, parking and construction issues, you want to be sure you are covered. You can do this getting an ATV policy. It is a good idea to start with the agent or company that already insures your home and auto, as they have an idea of what you own and can match your liability limits. 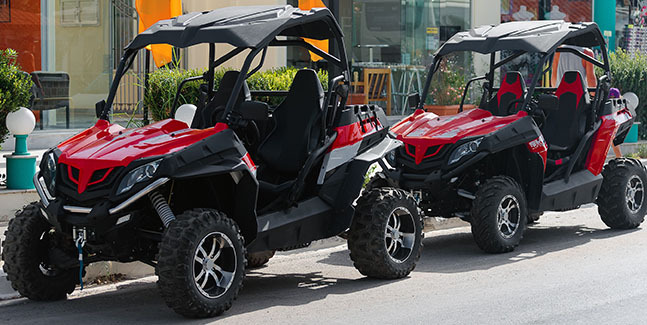 If you go to a direct company that only insures your ATV, you could end up with minimum limits that may not provide the protection you expected. How much does it cost to insure an ATV? The cost to insure an ATV will consider a few factors such as the year, make and model of the ATV, along with driving history and age of operators. It considers similar factors as car insurance but is typically a fraction of the cost. Does a NH Umbrella Policy Cover an ATV? Yes and no. An umbrella insurance policy is designed to provide an additional layer of liability protection over underlying policies. If you purchase an ATV, be sure to notify your agent so they can provide you with an ATV policy and ensure it is added to the umbrella. An umbrella policy typically requires an underlying policy exists with specific limits. If not, then you essentially have a very large deductible to pay out-of-pocket before the umbrella will take over. What Does a NH ATV Insurance Policy Cover? Bodily Injury and Property Damage: May pay for the injury you cause to someone else or for the property damage you cause while riding your ATV up to the limit you select. Comprehensive and collision: Collision coverage, if purchased, can pay for the damage to your ATV if in an accident with another object or vehicle. Comprehensive coverage, if purchased, can pay to repair or replace your ATV if stolen, vandalized, hit an animal or other act of nature. Medical payments: If in a covered accident with your ATV, medical payments can pay for the medical expenses up to what you purchase for you and/or your passengers. Additional coverage options are available depending on the company, but the more typical coverages include custom parts and equipment and roadside assistance. Regardless of where you drive your ATV, getting a separate ATV policy is a good idea.